Politics Back in Fashion in Thailand Despite Poll Delays - Integration Through Media ....! 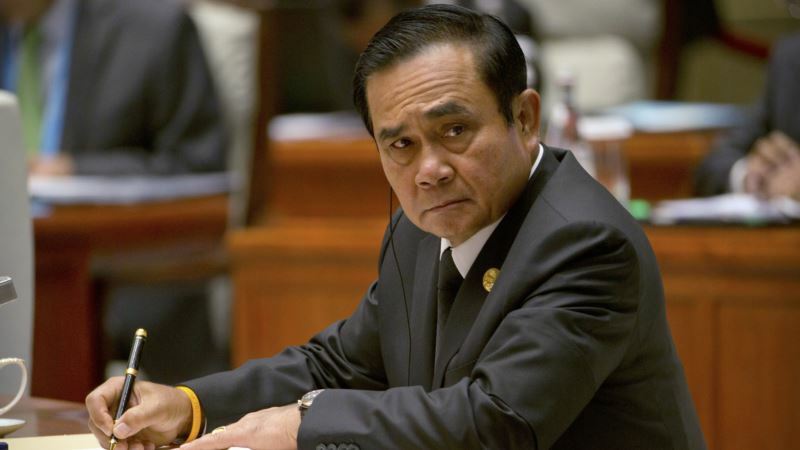 (VOA): Thai junta leader Prayuth Chan-ocha rowed a boat across a pond dotted with lotus leaves, planted some rice stalks in a field and turned to villagers who had come to meet him in Baan Saladin village in central Thailand. Prayuth was in Nakhon Pathom province last month not to campaign for an election, but to roll out his “Long-lasting Thainess” plan, which involves sending soldiers and social workers to meet with people across Thailand to listen to their problems. But the “Thainess” undertaking is widely seen as the unofficial launch of Prayuth's own campaign to stay on as prime minister. Prayuth had promised to hold an election in November, but said last week the vote would take place “no later” than February 2019. “Those in the government and the junta … think that the situation in the country is still unsettled,” said a government minister, speaking on condition of anonymity, about the series of election delays. In Bangkok, young, middle-class Thais, have led a series of anti-junta protests, including one on Feb. 24 at Thammasat University – which Thai troops stormed in 1976, killing dozens of students in an earlier coup. Than Rittiphan, a member of the New Democracy Movement, which has helped to organize the protests, said the movement is mainly aimed at holding a general election sooner. The movement transcends the red-yellow divide in Thai politics and “has actually spread into a conflict between generations and values,” he said. The students say they are pushing for a Thai meritocracy to replace what they see as corruption and nepotism in the system. The latest protests are too small to be a factor in any election timing, said Kan Yuenyong, a political analyst and executive director of the Siam Intelligence Unit think-tank told Reuters. “But they do increase public awareness about the vote. “The underlying politics of Thailand is still about class – the upper, middle and the working class. People try to say that we've moved on from color politics but we haven't,” Kan said. New King Maha Vajiralongkorn is contributing to some of the political uncertainty. The king, who's been married three times and lives much of his time in Germany, has moved quickly to consolidate power since taking the throne in December 2016, following the death of his father, the much beloved Bhumibol Adulyadej. He made changes to the Privy Council, which advises the monarchy, and has made appointments himself, taking some of the control away from the military. He made his own amendments to the military-drafted constitution and gained control of the Crown Property Bureau, which runs the more than $30 billion assets of the monarchy. The king has yet to set a date for his official coronation and some analysts think an election would not be held before then. The junta's four-year moratorium on politics was aimed at stamping out the intransigent red-yellow divide in Thai politics. The “yellow shirts” tended to support the Democrat Party, popular with middle-class voters with strong support in Bangkok and the Muslim-dominated south. The “red shirt” movement of ousted Prime Minister Thaksin Shinawatra and his sister, Yingluck appealed to poorer voters, particularly in the populous northeast. It has won every election in Thailand over the past two decades. Yingluck herself was overthrown by Prayuth in the 2014 coup and last year fled Thailand before the verdict in a corruption trial – eliminating a charismatic party figurehead who might also have rallied opposition to Prayuth. Although he cannot stand for election, the constitution offers a way for Prayuth to continue serving as prime minister. According to the constitution, both houses of parliament can consider an alternative candidate as prime minister if the 500-member lower house fails to approve a nominee for the post. The candidate would need majority support from both houses – all 250 senators in the upper house are appointed by the junta. Outside the legislature, Prayuth appears to have some support already. Representatives of 114 political groups met this month with the election panel, with many pledging support for Prayuth as prime minister. The two main parties, however, the Democrat Party and the Thaksin-allied Puea Thai Party, have openly criticized Prayuth's election postponements and will field their own candidates for the prime minister job. “The military wants to ensure that it can convince political parties to support it and that's why it needs more time,” said a senior government aide, referring to the repeated postponements of the election. Thaksin and his sister Yingluck held meetings in Hong Kong and Singapore last month with members of his party, prompting some to comment that he was readying Puea Thai for an election.